Scratched floors, lasting odours and stains; all part of owning a pet. As much as we love our pets, we can’t deny that they do come in the middle of having a home that feels fresh and beautiful. While domestic companions can prove to be a challenge, it is possible to have the best of both worlds renovating a home that is stylish yet pet-friendly. Keeping our pets in mind, may just pay off years down the line. A house that can withstand the wear and tear with curious canines is worth the investment. Going for hard-surface choices can make a difference to your maintenance budget. Terrazzo, vinyl and concrete are not only easy to clean and resistant to blemishes, they also give pets a cool place to nap in hot weather. Ceramic tiles have the same properties, though proper care must be done to clean “accidents” right away or risk getting the dirt being absorbed into the grouting. Materials such as marble, natural stone and wood should be avoided. #2 Be smart about rugs. Floor coverings aren’t necessarily a bad idea for pet owners, provided you know what you’re doing.Small rugs are the easiest choice, as they are easy to give them a quick wash if soiled. Even better, if they have patterns and colours to draw attention away from dirt, smudges and hair. Carpet tiles are a less fussy alternative, perfect for when there is a mess that is impossible to get rid of. Instead of replacing the entire thing, just remove the affected section. 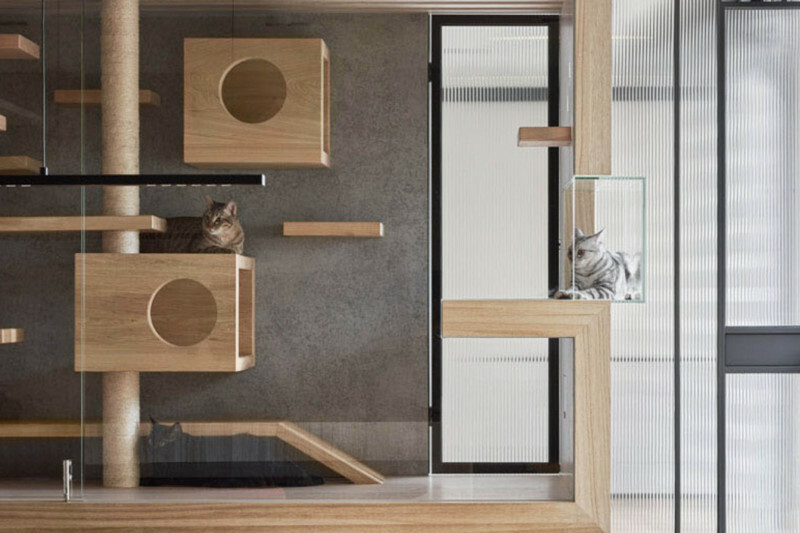 The lifestyle of your pet should come into play when planning the design of your newly-refurbished home. If your dog regularly goes for walks, install shelving by the doorway to ensure towels and leashes are within arm’s length. Save space and instil eating discipline with a pull-out feeding station. Designate a well-ventilated spot away from high-traffic areas to spare yourself the unpleasant smells of your lovable scamp answering nature’s call. Having breakables and animals together under the same roof is asking for trouble. Dogs are very excited animals to be aware they might knock over your collection of expensive chinaware, while cats don’t care. One way is to display your decor items in a cabinet, or invest in framed art. Send us an inquiry if you would like us to turn your home into a more friendly space for your pets!